Mediators Help Families With Tough Choices Of Aging Disputes over how to best care for aging parents can split apart families: Should Mom go into assisted living? Can we force Dad to hand over his car keys? A new option called senior mediation helps families negotiate these difficult situations and choices, and ensures that the voice of the senior is heard. Rikk Larsen, the founder of Elder Decisions, and his partner Crystal Thorpe interview two potential clients who are interested in mediation. An outside mediator is hired to help families make the best decisions about elder care. 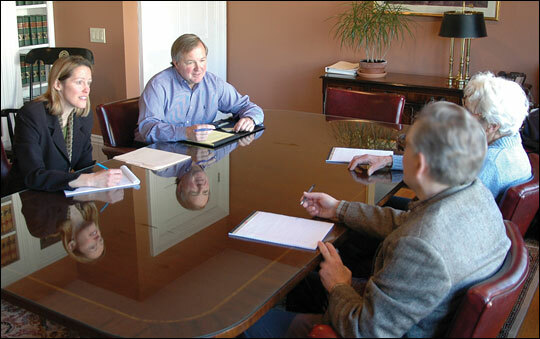 Mediation is voluntary, confidential and neutral, says Bob Rhudy, co-founder of the nonprofit Senior Mediation and Decision-Making Inc. in Baltimore. The goal, he says, is to give everyone a fair, safe place to share their concerns and help the family make informed decisions together. Some states have more resources than others, but start with state and local departments of aging, elder law attorneys, geriatric care managers and the health department, which can refer you to local resources. Search to see if there are mediators in your area at Eldercare Mediators and the Association for Conflict Resolution. Make sure mediators have experience working with elder issues. Senior issues require specific knowledge and skills — including the ins and outs of tax law and other legal issues affecting seniors, health care and housing options. A mediator also needs to be able to make sure a decision is in the best interest of the senior and work through a variety of complex family dynamics. States have different licensing, accreditation or certification requirements for senior mediation positions, so inquire with your state's department of aging to learn about your area's guidelines. Private mediators usually charge somewhere between $100 and $300 per hour. However, there are community mediation programs and volunteer programs that provide these services free or with a sliding fee in virtually all states. They are disputes that can split apart families: Mom's left a pot on the stove again, so her daughters want her to give up her house. Dad's got more scrapes on his car, so his kids want to take away the car keys. Now there's a new option for families: Call in an elder mediator, like Rikk Larsen. Larsen comes in as a neutral third party to help families negotiate difficult situations and choices. He talks about one case where an elderly father was getting forgetful and wasn't paying his monthly bills. His children — who lived far away — found out when the father's heat and electricity were turned off. But the elderly man got angry when the kids tried to help. "Dad simply didn't want any of his kids to know how much money he had and how his finances were organized," says Larsen, and things were getting worse. One son insisted on going to court to get his father declared mentally incompetent, so the family could take control of the father's finances. But after Larsen mediated, the brothers and sisters — along with the father — came up with a simpler solution. The father's accountant sent an assistant every couple of weeks to help the elderly man pay his bills. "It became this kind of business meeting that the father had, and he got to maintain his dignity and his sense of control, and the bills got paid," Larsen says. Sometimes just the presence of an outside party can make a difference. In another case, an elderly man's children warned their father that they were going to take away his car keys. He threatened to write them out of his will if they did. The man knew he wasn't driving safely anymore, but "pride entered the process," says Larsen, "and the elder didn't want to give the keys to a family member." With a mediation session, however, he came around and handed the keys to the mediator. "Giving the keys both actually and figuratively to a third party — the mediator in this case — was the gesture that broke the logjam," Larsen says. "So solutions can come in mysterious ways." Larsen, who used to work in marketing, started Elder Decisions seven years ago after handling estate and care issues for his own parents. Elder care raises some of the most complex issues in family mediation, he says. There can be a dozen or more interested parties in the room — and all have to come to a consensus. There are no rules and no legal procedure for doing so. Agreements are written out, but followed voluntarily. Trickiest of all are the family dynamics. It's not uncommon to hear one sibling bitterly tell another: "Mom liked you best." Larsen says long-established family roles can play out the moment siblings walk into a mediation. "When they come in a room and sit at a table, they'll very often take the position they took at the dinner table 30 or 40 years ago without even realizing it," he says. The field of elder mediation is growing, but it's little regulated. That worries Penny Hommel. "In reality, anybody who wants to can put a shingle out that says, 'I'm a mediator,' " she says. Hommel is one of the founders of the field. At the Center for Social Gerontology, in Ann Arbor, Mich., she's trained many of the people who do this work around the country — about 300. But she worries that too many people doing elder mediation lack the training to negotiate the complex legal, health and emotional issues that surround aging. That puts a lot of pressure on the consumer to find a mediator who has a lot of experience with elders. She advises people to look at a mediator's training, the numbers and types of cases they've worked. Private mediators charge $100 to $300 an hour for a session that can last several hours. But community mediation centers and others work for a nominal fee, or sometimes even for free. Rhudy says too many families wait until a crisis to seek out a mediator, and by then their positions have hardened, he says, making it more difficult for the many participants in a mediation to come to an agreement. But he says mediation has benefits over waiting to take disputes to court. Mediation, says Rhudy, "provides an opportunity to come together, make decisions that tend to work as opposed to litigation that can be more expensive, more contentious. People don't walk out of a courtroom smiling, shaking hands and feeling good. In mediation, that frequently happens."